884 m a.s.l. / 774 m a.s.l. The objective of long-term study at the sites of Lysina and Pluhův Bor is to compare biogeochemical patterns in two forested catchments with contrasting lithologies that can serve as examples of distinct sensitivity to anthropogenic acidification. The study is focused on element fluxes, pools, wet and dry deposition, internal recycling in trees, soil exchange processes, chemical weathering, nutritional status of trees and toxic metals speciation assessments, modeling predictions of hydrological, hydrochemical and soil chemical status. The both catchments studied are situated 7 km apart, within a large Norway spruce (Picea abies) forest on a plateau in the Protected Landscape Area Slavkovský les, near the town of Mariánské Lázně (Marienbad). The catchments have similar altitude, area, topography, mean annual air temperature, atmospheric deposition fluxes, and tree cover, but contrasting bedrocks and soils. The granite Lysina catchment represents sites with acid-vulnerable base-poor rock, extremely poor in magnesium. In constrast, the serpentine Pluhův Bor catchment represents sites with highly acid-resistant rock, extremely rich in magnesium. Magnesium in spruce foliage is deficient and consequent acidification symptoms of needle-yellowing are visible at Lysina. Annual increment of spruce bole biomass at Pluhuv Bor is low and attributed to potassium deficiency and nickel toxicity due to the serpentine substrate. 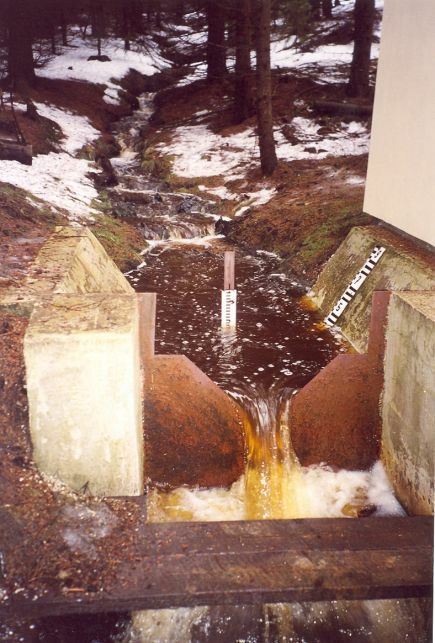 Streamwater at Pluhův Bor exhibited high pH, alkalinity, and very high concentrations of magnesium and nickel. Very low pH, negative alkalinity and very high concentrations of toxic forms of aluminum mobilized from soils by acidification were found in the stream draining Lysina. Contrasting streamwater compositions in the studied catchments were generated mainly by large differences in chemical weathering rates of base cations.